A trailblazer in San Diego’s legal community, Napoleon Jones was the second black judge appointed to the U.S. District Court in 1994 by then-President Bill Clinton. Perhaps best known for his ruling against the Boy Scouts in 2003 when he ruled that San Diego’s lease with the Boy Scouts for land in Balboa Park was an unconstitutional violation of the separation of church and state, Judge Jones career represented one of significant community involvement. As one of the few black judges in San Diego, he is remembered for helping pave the way for other minorities. He often served as a mentor and advisors to others, and was known for encouraging others to become judges while maintaining a family-like collegiality in chambers. 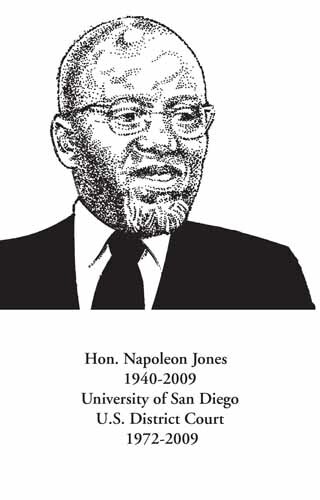 Judge Jones was born in Hodge, Louisiana, and raised in San Diego, where he attended Logan Elementary Memorial Junior High School and San Diego High School. He later attended San Diego State University, where he joined the Kappa Alpha Psi Fraternity. He was a social worker in San Diego and Santa Clara counties before becoming a lawyer in 1972. He earned his law degree from the University of San Diego and worked in private practice and with Defenders, Inc., which represented poor criminal defendants. He also worked with the Rural Legal Assistance Office in Stanislaus County. He was appointed as a Municipal Court Judge in 1977 and to the Superior Court in 1982, where he presided for many years in Juvenile Court. His career clearly demonstrates his commitment to the ideals of justice as was also evidenced by his service on the San Diego County Bar Foundation Board of Directors in its formative years. Known for always going the extra mile, Judge Jones worked until just a few months before his death from prostate cancer. He is survived by his wife and best friend of 19 years Dr. Rosalyn Baxter-Jones as well two children from his previous marriage. His daughter Lena Laini Jones and two grandsons live in La Jolla. He was predeceased by his 15- year-old son Napoleon Jones, III.